Back in 2006, two young students called Missak and Jordan met in high school and quickly became friends. 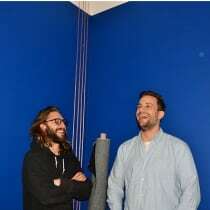 One day in 2013 the pair were discussing the beauty of selvedge denim, and realised that it was becoming increasingly difficult to find great jeans in Brussels. They decided to open their own boutique specialising in quality denim and the rest, as they say, is history. Atelier Bleu is now a staple in the vibrant quarter of Ixelles, stocking a handpicked range of quality denim brands from around the world. "Atelier Bleu was born out of a love for well-made jeans. We go crazy over the deep, rich colour of indigo, we love the rough texture of new jeans. When it comes to great denim, we are like a kid with a new toy!"